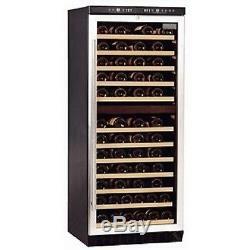 Polar Dual Zone Wine Cooler 92 Bottles - CE217. 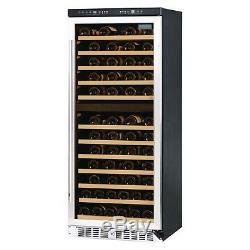 Ideal for the attractive presentation and efficient storage of large quantities of wine, the Polar Dual Zone Wine Cooler offers a generous 92 bottle capacity. With independently controlled temperature zones, your red and white wines can be kept at the perfect serving temperature, improving the bouquet of your wines and complimenting your menu perfectly. The stylish black and stainless steel exterior is designed to suit any front of house setting, whilst the efficient LED lighting ensures your wines are highly visible and beautifully presented. Dimensions 1445(H) x 595(W) x 570(D)mm. Power Type 220-240V, 180W, 1.4A. Temperature Range 5°C to 22°C. Frost-free with interior circulating fan. Maximum capacity is based on Bordeaux style 750ml bottles. Ambient temperature range: 16°C to 38°C. Most small items are delivered next day. We do not deliver to P. All of our prices are fully inclusive of VAT at the current rate. Full VAT invoices are supplied for your records. Prices listed are our best possible prices and further discounts are not possible. You can pay by cheque payable to "Cutting Edge Foodservice Equipment" However we will only despatch on cleared funds. We always try to sell excellent quality items and we are always available prior to order to answer any questions you may have. We cannot arrange collection from you however you can return to us at your cost. We will normally require photographic evidence to assist our claim. Cutting Edge Foodservice Equipment is an established Family run Catering Equipment Distributor. We strive to complete all orders efficiently and professionally, however on the rare occasions that problems arise we will resolve quickly to minimise any inconvenience to you the customer. At Cutting Edge Foodservice Equipment we offer fantastic prices and good old fashioned customer service. The item "Polar Wine Cooler Fridge Chiller Dual Zone 92 Bottles CE217 Commercial Display" is in sale since Wednesday, August 22, 2018. This item is in the category "Business, Office & Industrial\Restaurant & Food Service\Refrigeration". The seller is "catering-equipment-store" and is located in Thame, Oxon. This item can be shipped to United Kingdom.